Part of the excitement of travel is the opportunity to sample new food, whether it’s a real Neapolitan pizza or a badly needed freeze-dried dinner at the end of the day in the backcountry. However, travel also puts us into our vehicles and on airplanes for many hours at a time where good and healthy food can be scarce or expensive. Even in Italy where you’d think they would have all meals covered, you’re pretty much out of luck for a healthy breakfast unless you provide your own. 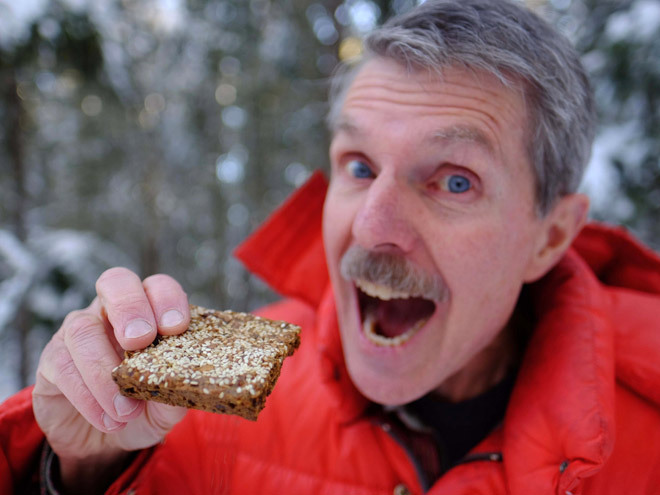 My solution to these challenges is something most people might call energy bars, but which I call by the more robust name, “Survival Bars.” They are not a treat to be served after dinner but rather little meals to be packed for serious snacking or a meal replacement while away from home. My tradition of making travel bars began long ago in the kitchen of my friends in Kitsilano where we lived at the time. They invited me to join them on a trip to look at property in the Chilcotin and the subject of road food came up—something convenient, filling, and healthy. As a willing experimental cook, I volunteered to concoct something using what I could find in their pantry and refrigerator. One of the factors for selecting ingredients was, “what will spoil while we’re away if we don’t use it up?” Overripe bananas, rolled oats, eggs, and milk were involved but my memory of the unrecorded recipe has receded with the intervening years, of which there have been approximately 40. I dubbed the results Chilcotin bars after our destination. Since then, I have taken variations of this travel food on dozens of trips ranging from backpacking in the Rainbow Range to picking olives while living with an Italian family. When I look at the energy bars on grocery shelves, I wonder how much money I’ve saved and how much sugar I haven’t consumed by making my own bars. So, for this article, I thought it would be interesting to compare my bars with a commercial product. I’m using Clif Bars for comparison because they’re popular and have been around for a long time. My bars are not an attempt to replicate any commercial energy bars and, based on the teasing I’ve received over the years, I’ve been successful. I vary this recipe every time I make it but the version described here is a simple one using ingredients that are available all year. I often use fresh fruit or vegetables depending on what’s in season, on sale, or in the fridge. Variations are described after the recipe, but first, here are the results of my comparison. For this article, I priced Clif Bars and ingredients for my bars from the bulk bins at Save On Foods. I’m using regular prices for comparison, even though Clif Bars and some of the raw ingredients were on sale on the day I shopped. Prices can vary widely depending on where you shop, whether you catch sales, and whether you buy in bulk. However, the price comparisons are what matter. Clif Bars are labelled as having “70% organic ingredients.” I priced both regular and organic ingredients for my bars so I could calculate their price per unit weight in both regular (not organic) and 100 per cent organic versions. The regular price of a 68 gram Clif Bar was $2.93. By weighing all ingredients and my finished bars, I calculated that my regular bars cost precisely 20% (one-fifth) as much as Clif Bars by weight and my organic bars cost 33% (one-third) as much. The difference in sugar content is even bigger. Clif Bars contain more than eight times the sugar in my bars (34% versus 4% by weight). The first three listed ingredients in Clif bars are oats, brown rice syrup, and dried brown rice syrup while the first three ingredients of my bars are oats, flour, and vegetable oil. As a subjective reality check, Clif Bars taste a lot sweeter than my bars. I would say at least three or four times as sweet. They are too sweet for my taste. Combine dry ingredients thoroughly, then add wet ingredients, mixing until uniform. Add up to ½ cup additional water if needed to facilitate mixing. Turn out onto a large (11×17) rimmed cookie sheet using a heavy duty spoon to distribute. Press the mixture to an even thickness right up to the rim using the back of a fork. Lay a sheet of waxed paper or plastic wrap on top and press the mixture into a uniform thickness with your hands. Discard the waxed paper. Bake at 250 to 300 degrees F for 1.5 hours. Cut into bar shapes, lift with a metal spatula, and turn the bars over. Return to oven and bake at 200 to 250 degrees F for about 2 hours or until fully dry. Low moisture content is what allows them to keep a long time. Seal in plastic bags. They keep for weeks at room temperature and many months if frozen. Instead of raisins, use any combination of soft, dried fruit such as prunes or dates. Add 2 cups of shredded apple, carrots, or zucchini. Add ½ c flour to balance the texture. Substitute any combination of seeds or nuts for walnuts. For more protein, add up to a cup of dry milk powder, use milk instead of water, or add one or two more eggs. Press sesame seeds into the dough before baking. Experiment with different amounts and types of ingredients. It’s a forgiving recipe. If my bars are an acquired taste, the main reason would be that they contain less sugar than commercial bars. If you’re used to the sweetness of commercially prepared foods, a way to reduce your sugar intake would be to cut out the commercial products and make your own, gradually reducing the sugar over time. In 2017, I took my bars to several places in North America, South America, and Europe. I didn’t just survive—I thrived.